Mendele Mocher Sforim 13 Apt 2: close to beach! Just 3 blocks from Ben-yehoda! 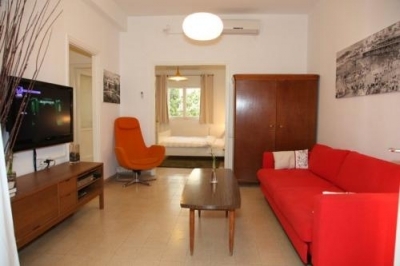 This authentic Bauhaus apartment has big living room and 2 bedrooms, separate kitchen with small dining room it's located on Mendele Mocher Sforim st, a very quiet street just 3 blocks from Ben-yehoda very close to the beach. We offer personal, warm hospitality and comfortable relaxing rooms that includes (among other) a double bed sofa in the living room. Free Wi-Fi service and a weekly cleaning service. All of our apartments are fully air-conditioned for cooling or heating.